Where you live impacts the winter fate of your Intex above-ground pool. If you live in an area with mild winters, you can winterize the pool and cover it for the season. If, however, you live in an area where freezing occurs, you'll have to drain your Intex pool and take it down for the winter. Luckily, these pools are some of the easiest above-ground pools to collapse and store. When swimming season ends, you can winterize or dismantle your Intex pool. Take the ladder, pool pump, filter and all related hoses out of your pool. Clean them all, and allow them to dry thoroughly. Locate the pool's drain valve. Remove the drain cover and attach your garden hose to the drain. Allow all of the water to drain from the pool, making sure your hose directs the water to a legal and acceptable location. Clean your pool liner after draining to remove any debris or algae clinging to it. Sprinkle cornstarch onto the pool liner to absorb any remaining water and to prevent the pool liner from sticking to itself during storage. When it is completely dry, roll your pool liner up. Carefully disassemble the pool's metal frame. Store it and all the other pool components in an area that will stay between 40 and 100 degrees Fahrenheit. Shock your pool about a week before closing it. This cleans the water and gives the chlorine level time to drop back down to the desired 1 to 3 ppm. If your chlorine level is too high when you close your pool, the chlorine will prevent the algaecide you'll be adding later from working. Clean the pool of all debris, dust and algae. Use the vacuum and the net to remove all contaminants from the pool. Test your pool water and adjust the water chemistry as needed to reach a pH level between 7.2 and 7.8. Adjust your pool's total alkalinity to a range of 100 to 150 ppm. Add a water clarifier as well as an algaecide to your pool. Run the pool pump for one day to thoroughly circulate these added chemicals. Close the pool's inlet and outlet valves, and then remove the pool pump, filter and accompanying hoses. Clean this equipment and allow it to dry thoroughly before storing it at room temperature. Do the same with the ladder and pool skimmer. Cover the pool with a locking pool cover. Remove standing water from the top of the pool cover as needed throughout the winter. 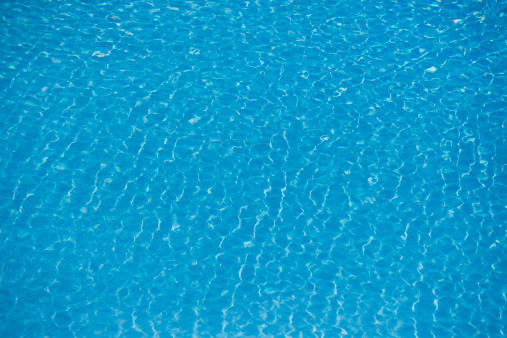 Water left on the cover creates excess weight and could damage your pool cover.